Set out a bowl of each ingredient with a serving spoon. 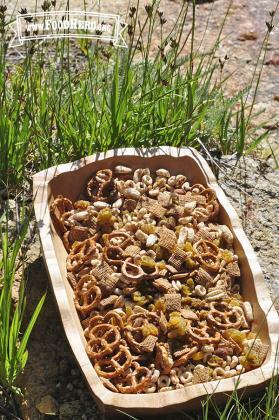 Let guests add a spoon of each ingredient to a platic bag or other container. Shake to mix. Enjoy! Peanuts and other small foods that are round are easy for your preschooler to choke on when swallowing them. Have your child eat at the table, or at least while sitting down. Always watch your child while he or she eats. Serve as a snack along with sliced fruit.